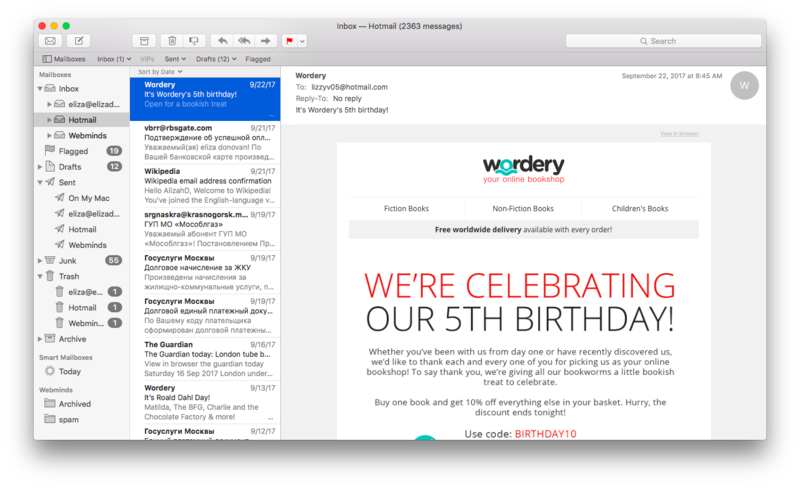 Email clients are great – they make it so easy to manage emails from multiple accounts in one place. But there’s one problem. When you have several email accounts connected to one email client, it’s very easy to lose track of messages and contacts. In this article, we’ll share with you some tips that will help you organize email and contacts in your email client. The first step to having an organized mailbox is to use an intuitive and reliable email client. There are plenty of choices for Windows, Mac, iOS and Android. Microsoft Outlook and Mac Mail work well on desktops and laptops, whereas BlueMail is a great Android email client. When you find an email client that works for you, take your time to set up your accounts and configure syncing. It’s also important to choose the display settings that increase your productivity. Some people feel comfortable using a unified inbox whereas others prefer keeping emails from different accounts separate. Doing that will help you save a lot of time in the future. Now that you have configured all the settings, make sure that you keep your inboxes in good shape. It’s only too easy to end up with a cluttered inbox and a messy contacts list. While the best strategy is to process your email on a regular basis, that’s not always possible. And then things get worse when you accumulate duplicate email messages and create duplicate contacts. Just think how embarrassing it can be to send the same email to the same person twice! The simplest and the most efficient way to delete duplicate emails and contacts is to avoid creating them in the first place. But if that didn’t quite work out, don’t worry – a program like Easy Duplicate Finder can help you find and remove the duplicates in just a couple of clicks. With its help you can manage duplicate emails and contacts in Microsoft Outlook for Windows and Mac, and Mac Mail. Using Easy Duplicate Finder to delete duplicate email messages and contact entries is easy. All you need to do is select the appropriate scan mode and follow onscreen instructions. The program will do the rest for you and make your email client clean, fast and organized.